Document Friday: The Origins of “Glomar” Declassified. On 19 March 1975, the New York Times’ front page included Seymour Hersh’s headline story, “C.I.A. 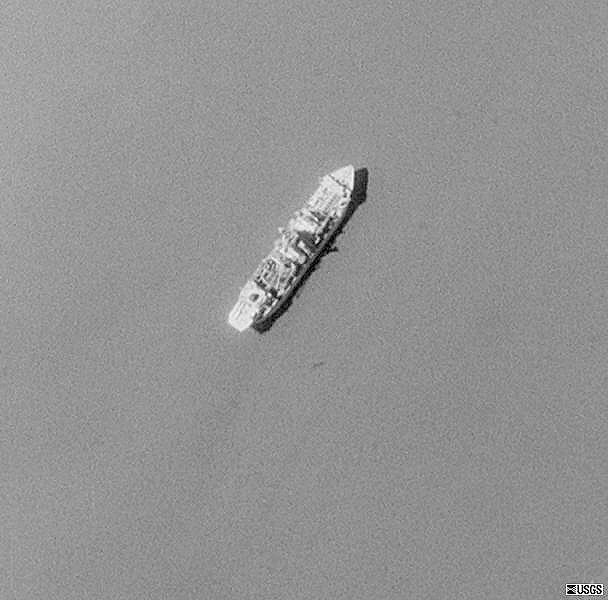 Salvage Ship Brought Up Part of Soviet Sub Lost in 1968, Failed to Raise Atom Missiles.” This was the story of the ship Glomar Explorer, constructed by one of Howard Hughes’ companies under CIA contract, and built to salvage a Soviet submarine three miles in Pacific waters. The National Archives has recently declassified in full, in response to a mandatory declassification review appeal, the record of a White House discussion that same day about Hersh’s story. President Gerald Ford met with White House advisers, Secretary of Defense James Schlesinger, and CIA director William Colby and discussed a response to the disclosure of “Operation Matador,” the code name for the salvaging project. 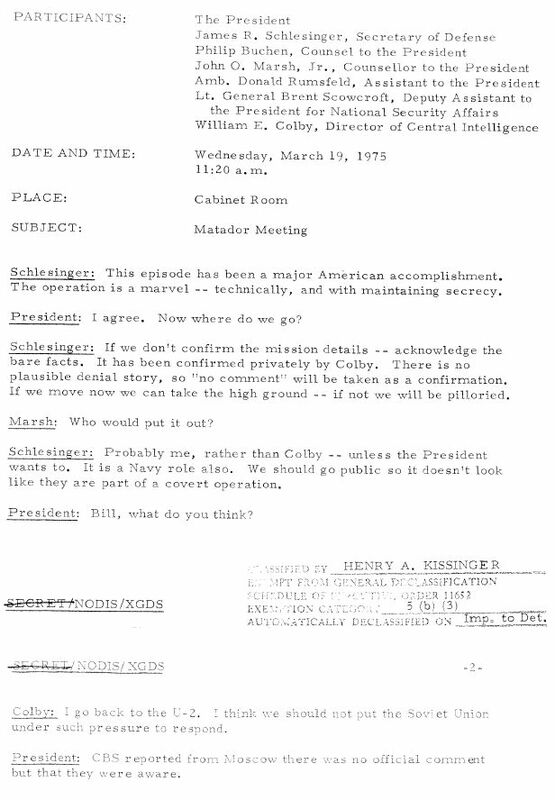 Schlesinger wanted to confirm the story because it was “a major American accomplishment”, a “marvel,” and going public would help it avoid looking like “part of a covert operation.” Unpersuaded, Colby wanted to keep the lid on it. Recalling the May 1960 U-2 affair, when President Eisenhower acknowledged his responsibility which led to the collapse of the Paris summit meeting in May 1960, Colby wanted to take a different tack: “We should not put the Soviet Union under such pressure to respond.” With U.S.-Soviet détente under pressure in the United States, Colby thought it better to avoid new tensions in relations with Moscow. Colby’s advice prevailed and the next day the Los Angeles Times had a story by reporter Jack Nelson with the headline, “Administration Won’t Talk About Sub Raised by CIA.” While Colby’s decision was understandable on foreign policy grounds —he probably saw it as a “good” secret compared to “bad” ones, such as in the “Family Jewels”—it became infamous in the world of FOIA requesting and litigation. In the wake of Hersh’s story, journalist Harriet Ann Phillippi filed a FOIA request asking for documents on the Agency’s earlier attempts to discourage reporting on the CIA’s project to salvage a sunken Soviet submarine. In response, the Agency said it could “neither confirm nor deny” its connection with the Hughes Glomar Explorer. Phillippi filed a lawsuit, but the U.S. District Court of Appeals upheld the CIA’s position. Since the Phillippi v CIA decision, the term “glomarize” or “glomar response” have become terms of arts to describe the circumstances when the CIA or other agencies claim that they can “neither confirm nor deny” the existence of requested documents. The term “Glomarize” will continue to be used, but the initial basis for the CIA claim no longer exists. In the last few years, the Agency declassified internal studies of the Glomar Explorer operation, a documentary was released, and a number of books have appeared. One of them is a memoir by David Sharp, a CIA officer who had major responsibility for the salvage operation. After a protracted battle with Agency reviewers, who initially but unsuccessfully tried to suppress significant portions of the manuscript, David Sharp published The CIA’s Greatest Covert Operation with the University of Kansas earlier this year.